John's wife Lindy and their children Rosie and Sandy have set up a John MacLellan Tribute Fund at the Beatson Cancer Charity to help raising funds for Beatson who helped to care for John. When they set up the fund they said they were hoping to raise £5,000 for Beatson, as of writing this the total was already standing at £5,859. May be £10,000 can be reached after all, doubling the £5,000? If you knew John and would still like to donate why not head over now. 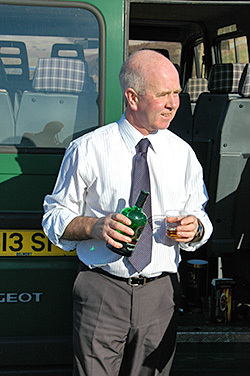 I understand the funeral service took place at Kilchoman today, I'm going to pour a wee dram of Kilchoman Islay single malt whisky (in a Bunnahabhain glass) in memory of John tonight.